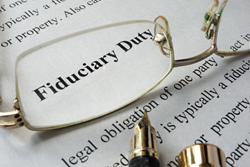 Fiducuiary Duties and Responsibilities of Successor Trustee to Administer California Real Property and Real Estate Tip Sheet by Deed and Record. The Successor Trustee assumes fiduciary duties and responsibilities on the death of the trust owner. California has very specific duties and responsibilities for real property and real estate in California as explained by Deed and Record in this Tip Sheet. Look to the "last transfer document" for how real property is owned. The Successor Trustee assumes fiduciary duties and responsibilities on the death of the trust owner. This Tip Sheet by Deed and Record explains the specific steps and procedures the Successor Trustee must take for real property and real estate in California. The first step is to determine who owns the real property. Data on who is the rightful owner of real property in California is maintained by the County where the real property is located. From this data base the Successor Trustee must locate the “Last Transfer Document.” The Last Transfer Document will identify the owner by his or her name only or by his or her name as Trustee of his or her trust. control of the real property, but still has the duties and responsibilities. In this scenario, the Successor Trustee must file a petition in the Superior Court of California. But if on the date of death, the trust owns the real property an affidavit, death of trustee is required. An affidavit, death of trustee is a declaration by the successor under penalty of perjury, the fact the owner has died and the successor trustee is authorized by the trust to act on behalf of the trust. The affidavit is easy to prepare and does not require any court filings. The affidavit must be submitted to the county recorder to update the data base of who has control of the real property. Next, the Successor Trustee must provide notice to heirs of the decedent and beneficiaries of the trust as required by California Probate Code Section 16061.7. The notice includes information that the owner has died, that the Successor Trustee has assumed responsibility for the real property and how to contact the Successor Trustee. The notice must also either include a copy of the trust or let the heirs and beneficiaries know they may request a copy of the trust. The successor trustee must also review the trust for instructions on what to do with the real property. Most often the decedent directs one of two actions; either transfer ownership or sell the real property and transfer the sale proceeds to the beneficiaries of the trust. Ownership transfer is by deed. The deed is signed by the successor trustee on behalf the trust. Ownership is changed from the trust to the beneficiaries of the trust. The deed is submitted to the County Recorder to update the data base of rightful owners. If the beneficiaries are children of the decedent, the deed must be followed up with a “Parent to Child Property Tax Reassessment Exclusion for California Property Tax” to prevent an increase in property taxes. If the trust directs sale of the real property, the Successor Trustee has authority to sell with the affidavit death of trustee submitted to the county recorder. Sale proceeds are deposited into a trust account and checks are issued to the beneficiaries. If needed, the successor trustee holds back enough funds to pay outstanding debts, funeral costs and costs to administer the trust. The Successor Trustee assumes fiduciary duties and responsibilities on the death of the owner who has created a trust. What actions the Successor Trustee should take depend on how the real property is owned. If real property is in the name of the owner, the assistance of the probate court is needed. If the real property is owned by the trust, the Successor Trustee can proceed to administer the trust and either sell the real property or transfer ownership of the real property to the beneficiaries of the trust.